What Kind of Gravy Do You Need? Gravy (not to be confused with Italian tomato sauce gravy) is generally defined as a sauce made from meat juices, often combined with broth or milk, and thickened with a starch. It can also be the reduced juices left from cooking proteins such as meat, fish or poultry. Although it is fairly simple to make, many home cooks have a difficult time making flavorful, smooth gravy. Understanding the process and learning a few tricks of the trade should help you make perfect gravy every time. First, you'll need to determine what type of gravy you want for your dish. 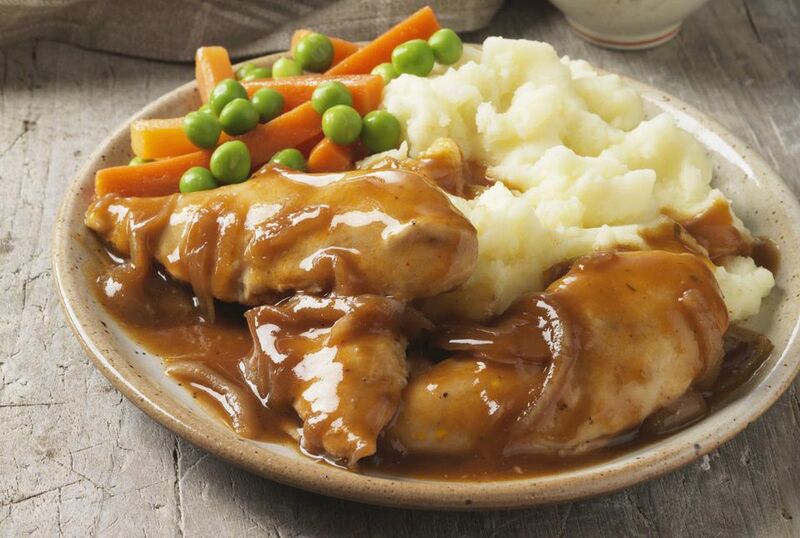 For a lighter touch, stick with a simple pan gravy. If you're looking for a heartier gravy to top a starch such as mashed potatoes, rice or you'll probably opt for a thickened gravy. Here you'll find some helpful tips for creating and using each type of gravy. Most pan gravies are a simple reduction of the juices left in the pan after the food is cooked. Often a bit of water or broth is added to the pan drippings, scraping up the cooked pieces from the bottom of the pan, then allowed to cook down and thicken on its own. A dab of butter is often added at the end to give added flavor and a glossy finish. This is the easiest gravy to make and virtually can't go wrong, but often a more hearty gravy is desired, one that is thicker in texture and creamy in color. If you've burnt your food, however, you might want to avoid making a pan gravy unless you like burnt flavors. You can save a slightly scorched pan by removing any overly burnt bits before making the gravy. There are several popular thickeners for gravy including flour, cornstarch, arrowroot, and dairy products. Each one will produce different flavors but none are hard to make. The methods differ for different thickeners, but they all basically begin with the simple pan gravy described above. It's difficult to give an exact recipe since it will depend on the amount of seasoning on the meat and its fat content. The measurements do not have to be extremely precise as in baking. You should be able to judge by eye. When using flour to thicken your gravy it's important to keep stirring in order to ensure that you have a smooth texture. A whisk is a great kitchen utensil to make gravy with because it will help to smooth out all the lumps. Using a beurrer maine or as it's known in English "kneaded butter", which is a dough formed from mixing butter and flour will help thicken gravy with far fewer lumps.